Three new PhD students have now been recruited to join the Sheffield-Manchester platform. 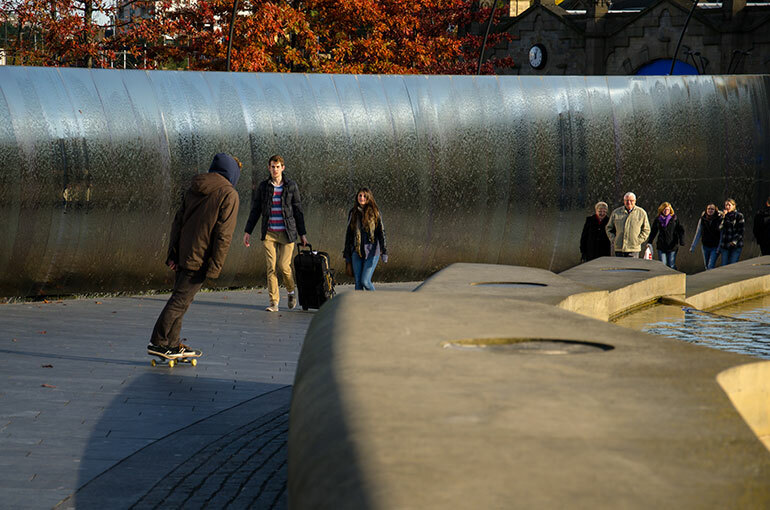 Led by Professors Tim May (Sheffield Methods Institute) and Beth Perry (Urban Institute), the PhD cluster will deliver projects through coproduction partnerships in the North of England to contribute to the aims of the realising just cities programme. Inspired by the Cape Town Knowledge Transfer Programme, previously funded by Mistra Urban Futures, the UK students and their supervisors will reflect and learn about the opportunities and challenges of undertaking engaged interdisciplinary post-graduate study. The students will start their studies in Autumn 2017 and will be supported by the Department of Urban Studies and Planning. Jenny Patient. Jenny’s PhD proposal has developed from work over the last 3 years to engage trade unions around climate change. Making connections through the fringe programme around COP21 in Paris led to conversations with trade unions in energy-intensive industries, such as steel, glass and cement, that underpin the cities of Leeds, Hull and Sheffield. As a PhD student within the Realising Just Cities programme she is looking forward to developing knowledge that can help trade unions play their full role towards an energy transition that brings both sustainability and justice, at a time when action on climate at a city level has never been so important. Jenny will be co-supervised by Beth Perry and Stephen Connelly. Jenny's first career direction was managing computer projects in the UK railways, before a change to adult education where she has worked in community regeneration, active citizenship and sustainability. Her degree in Maths (University of Warwick, 1984) sneaked in some Sociology, followed by a post-graduate teaching certificate in 2004 (University of Huddersfield). A Masters in Human Ecology (2005-2007, University of Strathclyde) confirmed Jenny’s interest in action research and participatory processes, whilst grounding her subsequent work on energy and climate change at Heeley City Farm and Sheffield Climate Alliance. Ryan Bellinson In October 2017, Ryan will begin a PhD studentship on communication, engagement and environmental governance in Greater Manchester. Building on previous Mistra Urban Futures work on governance and policy for sustainability (link to GAPS project), a partnership agreement has been made with the Greater Manchester Low Carbon Hub to develop an action research project to effectively engage the public in developing climate change and environmental policies. This will build on the new Greater Manchester Mayor’s Green Summit planned for March 2018. More broadly, Ryan’s research will contribute to the SMLIP’s work on Participatory Cities which seeks to improve communication between government decision-makers with citizens and civil society groups within the Greater Manchester city-region. Ryan will be supervised by Beth Perry and Aidan While. Ryan earned a B.SC. in environmental studies from the University of Oregon (2015), and an M.Sc. in urban studies from the University of Amsterdam (2017). Ryan has also worked as a constituent affairs intern for United States Senator Jeff Merkley and was a land use planning and air toxins policy fellow in the State of Oregon Governor John Kitzhaber’s Natural Resource Policy Office. Alexandra McVicar-Payling's PhD will be focused on understanding the limits and possibilities of universities as agents of change in realizing just cities. It focuses upon the social organisation of knowledge production in the university in relation to its contribution to social justice. Alex will be supervised by Tim May and Rowland Atkinson. Alexandra Formerly from Medicine Hat, Alberta, Canada, Alexandra spent a number of years living in the British military community in Germany and the UK before relocating to Sheffield. Alexandra completed a BA (Hons) Politics and International Relations (1st) at the University of Sheffield and then, also a MSc Politics with Research Methods (part-time) whilst providing home-based care and education for her two young children. Whilst studying, Alexandra conducted research in the Department of Politics as well as in the public sector. Her work has included looking at the British Government’s response to the Arab Spring; collecting survey data for a project on political participation and contributing to a co-authored report examining the extent that the economic growth strategy for the Sheffield City Region was gender-aware.